Jean-François Millet (1814–1875), The Potato Harvest (1855), oil on canvas, 54 x 65.2 cm, Walters Art Museum, Baltimore, MD. Wikimedia Commons. With the success of Millet‘s The Sower at the Salon in 1850, the artist achieved his first real recognition. His next major work, Harvesters Resting (Ruth and Boaz) (1850-53), was successful in the Salon of 1853, and sold from there to Martin Brimmer of Boston, MA. It is now in the collection of the Museum of Fine Arts, Boston. The following years were a very productive time for Millet, with a series of significant paintings showing the poor working the land, made mostly from the farmland adjoining the Forest of Fontainebleau, where Millet was living in the village of Barbizon. Jean-François Millet (1814–1875), Going to Work (1851-53), oil on canvas, 55.9 x 45.7 cm, Cincinnati Art Museum, Cincinnati, OH. Wikimedia Commons. 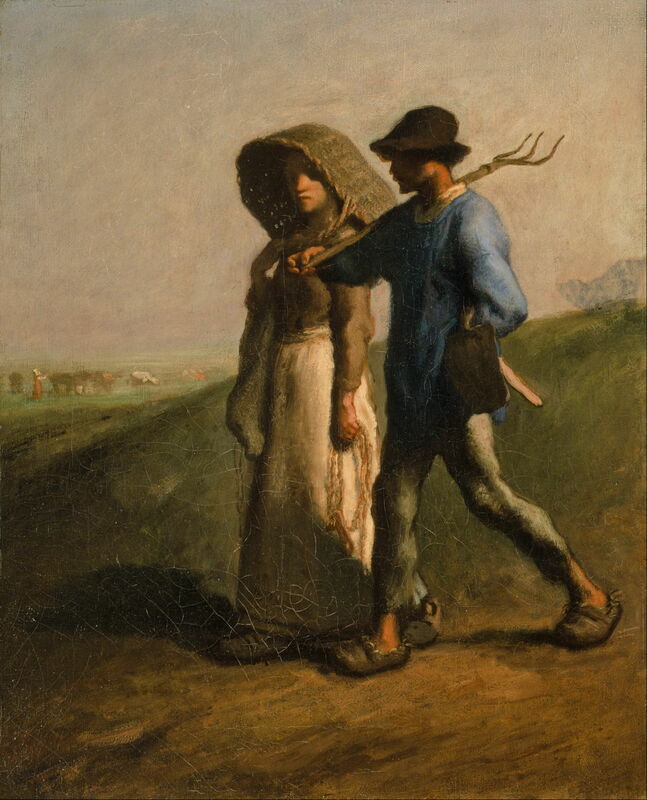 The young couple seen Going to Work (1851-53) are equipped for their day in the fields. She wears a wicker basket over her head, and carries a sack and a length of rope. He has a pitch-fork on his shoulder, carried as if it were a soldier’s rifle. Both are thin and dishevelled, from their outsize worn-out shoes up to his crumpled hat. The man’s thin ankles are almost a caricature to indicate perpetual hunger, but they still stride out to work in the light of the early morning. Jean-François Millet (1814–1875), Seated Shepherdess (c 1852), oil on canvas, 46.4 × 38.1 cm, Minneapolis Institute of Art, Minneapolis, MN. Wikimedia Commons. 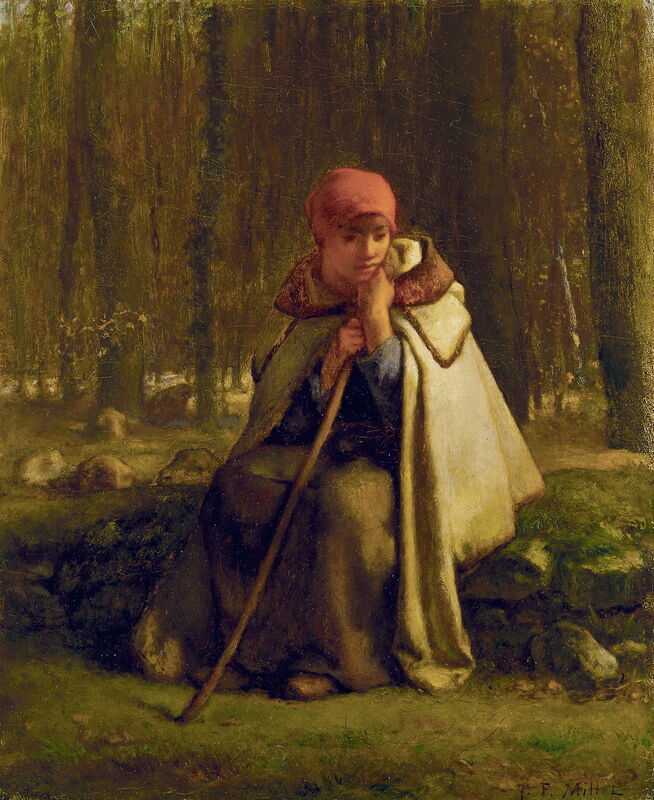 More characteristic of the wooded countryside around the village of Barbizon, Millet’s Seated Shepherdess (c 1852) demonstrates the marked differences from Breton’s full-length portraits of young country women either around Courrières or in Brittany. Millet’s figures lack fine detail and are formed in a more painterly manner, as precursors to the ‘impression’ which was to come to the fore during the 1860s and 1870s. The flock of sheep are formed quite gesturally into a few vague masses, the head of one resting on the low bank on which the shepherdess is seated, just to the left of her right knee. The trees behind merge quickly into a dense texture, losing their individual forms. 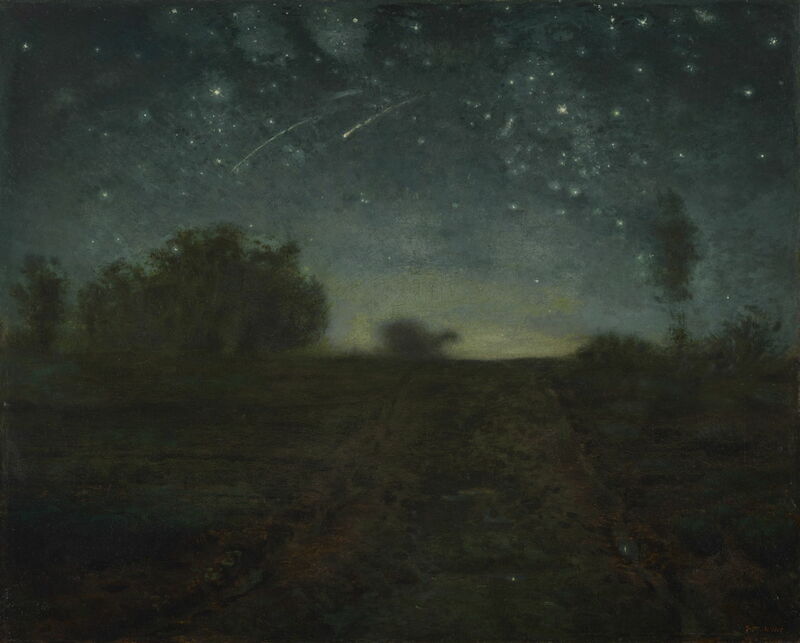 Jean-François Millet (1814–1875), Starry Night (c 1850-65), oil on canvas, 65.4 × 81.3 cm, Yale University Art Gallery, New Haven, CT. Wikimedia Commons. Starry Night (c 1850-65) is an unusual nocturne which may have been painted rather later. As in Nikolai Astrup’s much later paintings of Norwegian summer nights, the forms of trees are ill-defined and indistinct. The stars and a couple of meteor trails above resolve more crisply, giving the simple composition a much grander scale. A couple of the stars are also seen in reflection in puddles along the rutted muddy track, which the dark allows to merge with the surrounding fields. Jean-François Millet (1814–1875), The Potato Harvest (1853), black chalk, stumped, heightened with white chalk on rough oatmeal paper, 22.9 x 34.9 cm, The Morgan Library & Museum, New York, NY. Wikimedia Commons. Millet’s drawings from this period are also a delight, and their simplified forms were later to appear in the work of other master draughtsmen such as Georges Seurat and Odilon Redon. 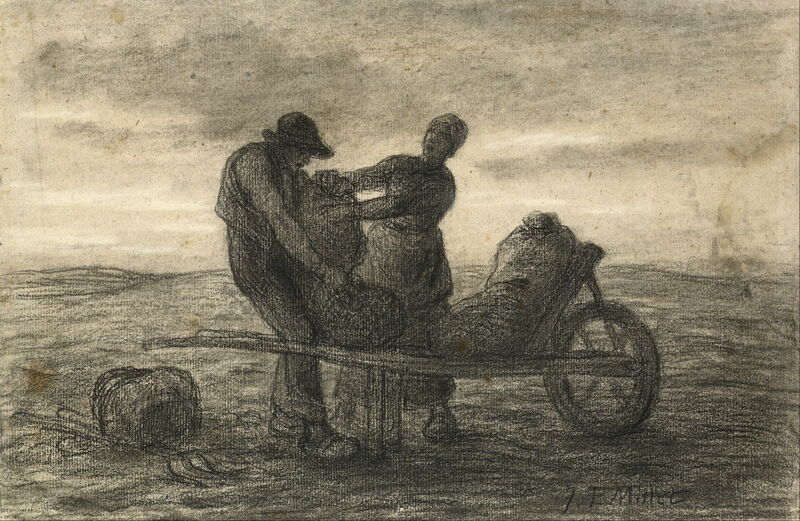 The Potato Harvest (1853) is a good example, worked using black chalk with white chalk highlights. A man and a woman are seen filling sacks of harvested potatoes, their forks resting on the ground to the left. The heavy sacks are then placed on a simple wheelbarrow, to be moved laboriously back to the farm. This was perhaps the first appearance in his work of a motif which was to reappear most notably in his later l’Angélus. Jean-François Millet (1814–1875), Sheep Shearing (c 1854), oil on panel, 16.2 × 11.3 cm, Private collection. Image by Caful111, via Wikimedia Commons. 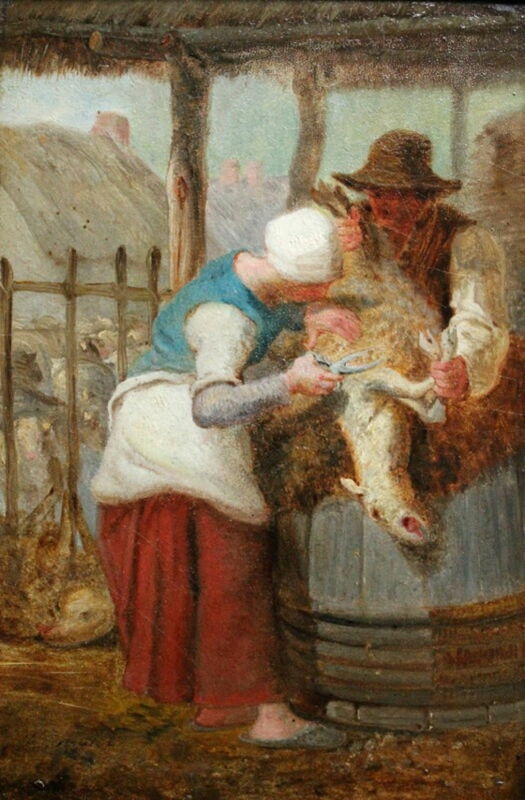 Sheep Shearing (c 1854) shows the highly skilled task of hand-shearing the fleece from a sheep. A man holds the animal still, resting over the end of a large barrel. A woman is using hand shears to cut the fleece from the sheep, as was universal before the introduction of machine shearing from 1888. Even with highly-skilled hands, this is a difficult process, and it is hard to remove the complete fleece. In some parts of the world, itinerant shearing teams would have performed this task, but for small flocks on poor farms it had to be carried out by those working the farm. Jean-François Millet (1814–1875), The Shepherdess (1852-62), black chalk on off-white wove paper, 30.7 x 38.4 cm, University of Michigan Museum of Art, Ann Arbor, MI. Wikimedia Commons. 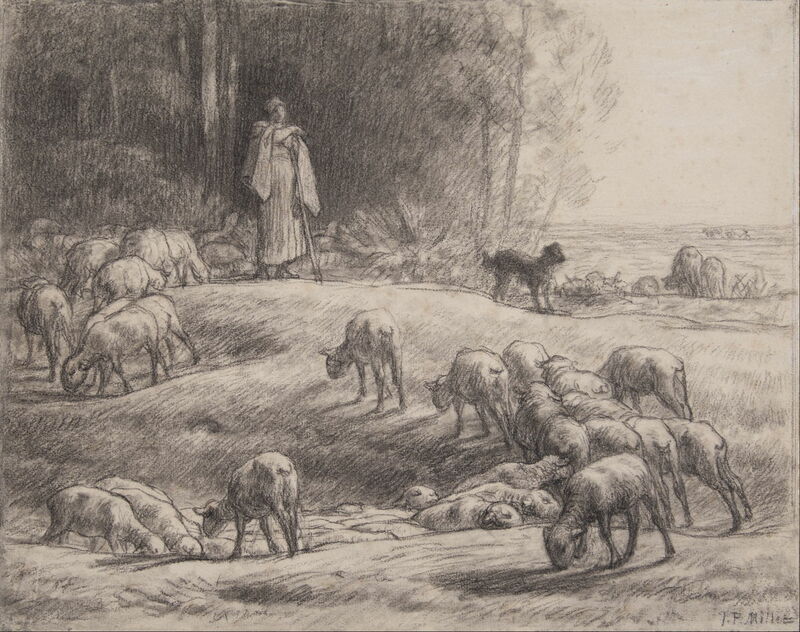 The Shepherdess (1852-62) is less densely-worked drawing in black chalk, showing a woman with her working dog, tending her flock on the rough land at the edge of a dense wood, probably close to the village of Barbizon. 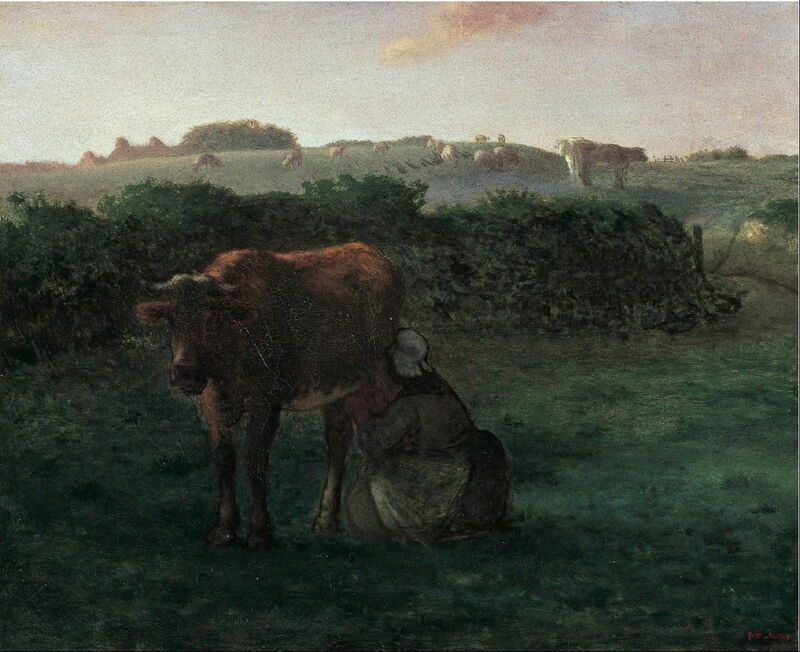 Jean-François Millet (1814–1875), Woman Milking a Cow (1854-60), oil on canvas, 59 × 72.4 cm, Bridgestone Museum of Art ブリヂストン美術館, Ishibashi Foundation, Tokyo, Japan. Wikimedia Commons. Before the introduction of machine milking and milking parlours in the early twentieth century, scenes such as Millet’s Woman Milking a Cow (1854-60) were common: the milkmaid would take her pail out to the individual cows and milk them on location. Jean-François Millet (1814–1875), The Hamlet of Cousin near Gréville (1855), oil on canvas, 71.5 × 91.5 cm, Musée des beaux-arts de Reims, Reims, France. Wikimedia Commons. 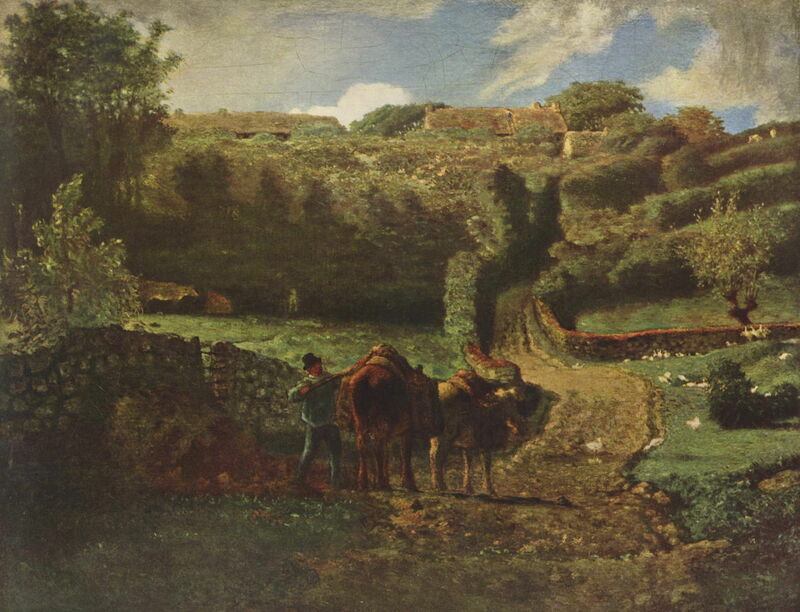 In Millet’s The Hamlet of Cousin near Gréville (1855), the artist has returned to the hamlet of his birth, and shows the rough lane leading to another nearby hamlet, Cousin. A man, possibly a local trader, is attending to the load on his animals (I’m not sure if they are donkeys), and the bottom of the valley is dotted with geese. This rolling countryside with hedgerows enclosing tiny fields contrasts greatly with that around Barbizon. The Potato Harvest (1855) is another more substantial work developed from drawings such as that shown above. This more complex composition features half a dozen figures, but is still far less busy than Breton’s harvest scenes. In the foreground, a man and woman are working together to fill sacks with the harvested potatoes, which will be loaded onto the wagon behind them. The other four work as a team to lift the potatoes using forks and transfer them into wicker baskets – gruelling and back-breaking work. Although the fields in the left distance are lit by sunshine, the dark scud-clouds of a heavy shower fill the sky at the right. Being poor, none of the workers has any wet-weather gear. The soil is poor, full of stones, and yields would be low despite the full sacks shown at the right. Millet had gone from strength to strength during the early 1850s, and established his simple, naturalistic style on rural ‘genre’ subjects. These avoided earlier sentimentality, were far from idyllic, and showed life on the land as it really was. His style and subjects thus reinforced one another as faithful expressions of what country life for the poor was really like. 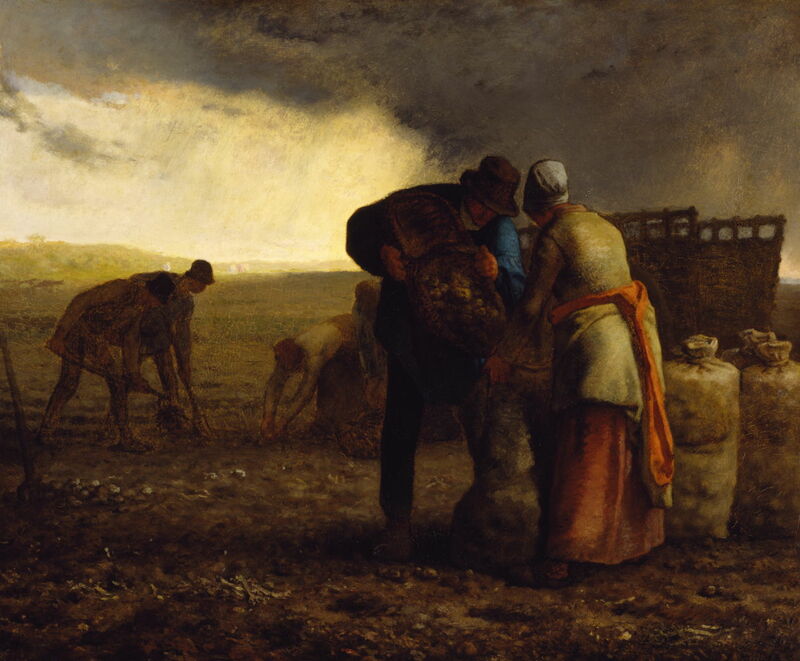 The late 1850s would see two further masterpieces: The Gleaners and l’Angélus. Posted in General, Painting and tagged Astrup, Barbizon, Breton, Millet, painting, Redon, Seurat. Bookmark the permalink. Wonderful selection of pictures and I really enjoy your evocative commentary. Such a delight.